Ready for a great show cooking? Michelangelo Mammoliti born in Giaveno and in Guarene, nearby Alba, in the exact place where Langhe kisses Roero. He runs the kitchen of the restaurant La Madernassa from 2014. At the top of his experiences he worked with Gualtiero Marchesi, first at L'Albereta, his restaurant in Erbusco Franciacorta. However, the meeting with Stefano Baiocco, two Michelin stars, changed the life of Michelangelo. After that he went to France where he will last more than five years at the court of the best chefs the world panorama can mention: Alain Ducasse, Pierre Gagnier, Marc Meneau. 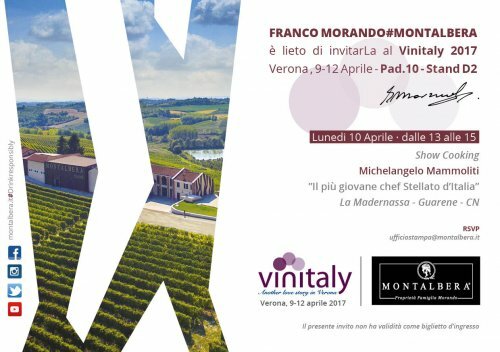 Michelangelo Mammoliti will be with Franco Morando on Monday 10th for a great show cooking. This will be the opportunity, in conjunction with his famous dish "Astrattismo tribute to Kandinsky", to present our new white wine!